It’s Friday, so of course our players are giving me extra work tonight. Later in the post, I’ll discuss Tom’s Antepenultimate Wager – I didn’t like it all that much. This is a two-horse race. Pat has less than the difference between Tom and Kerry, so she is effectively eliminated. If Kerry doubles her score, she’ll have 23,200. To cover this all-in wager, Tom will need to wager 2,400. An incorrect response with that wager will leave Tom with 18,400. To get above his total, Kerry must wager at least 6,800. Might as well go for broke. A successful doubling will put Pat at 16,000. To cover this, Kerry should wager at least 4,400. Tom could wager at most 4,800. I can understand a desire to rake in some extra cash on a strong category but it should never – ever – come at the cost of allowing an eliminated player back into the game. In short, this is a bit of a Clavin. How do you feel about BIG BUSINESS? That’s the question Tom faced when he found the last Daily Double under the $1200 clue in that category. All that remained was an $800 clue. He had a sizable lead over Kerry – enough that he could put it away immediately. Alex even made a comment to this effect. Let’s start by assuming he loves the category. So let’s put it away now! Worst-case scenario is that Kerry gets the remaining $800 clue, putting her at 12,400. So Tom would need to have 24,801. 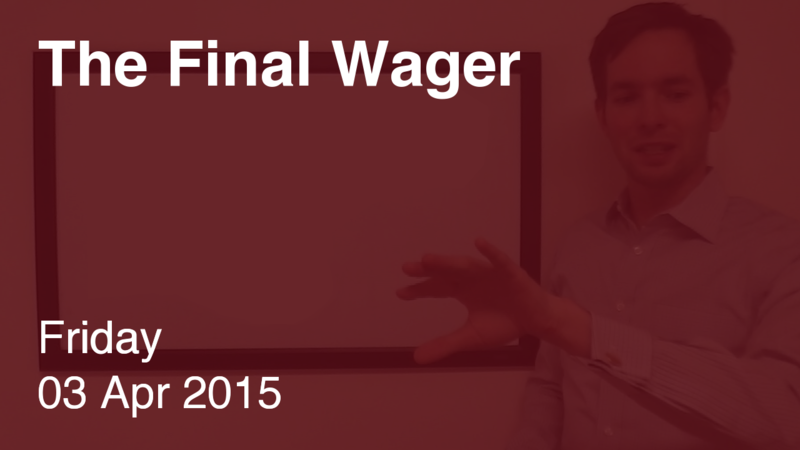 If he’s wrong with that wager, he’ll have $8,799 – still very much alive. Now, if he doesn’t like this category, I suggest he wager to get above 1.5 times Kerry’s score. This means she would have to get it right in Final to have a chance. To find the target number, take one-half of Kerry’s worst-case score and add it to her present score. One half of 12,400 is 6,200; together, those equal 18,600. Beware the siren’s call of round numbers. Based on what turned out to be a somewhat bogus story on the Internet I asked the question: What’s the spelling rule on FJ clues? I suspected the answer was “if the contestant’s spelling could reasonably be pronounced identically to the correct response then the response is scored as correct”. Tonight, Alex confirmed that.